The term “biomass” refers to organic matter that has stored energy through the process of photosynthesis. It exists in one form as plants and may be transferred through the food chain to animals’ bodies and their wastes, all of which can be converted for everyday human use through processes such as combustion, which releases the carbon dioxide stored in the plant material. Many of the biomass fuels used today come in the form of wood products, dried vegetation, crop residues, and aquatic plants. Biomass has become one of the most commonly used renewable sources of energy in the last two decades, second only to hydropower in the generation of electricity. It is such a widely utilized source of energy, probably due to its low cost and indigenous nature, that it accounts for almost 15% of the world’s total energy supply and as much as 35% in developing countries, mostly for cooking and heating. Briquetting Machine is the best option to produce energy for organic materials such as agriculture waste, green waste, municipal waste etc…People are well aware for new generation’s future and they want to make it better and better. So briquette plant is the way to generate biomass energy and earn revenue for future. 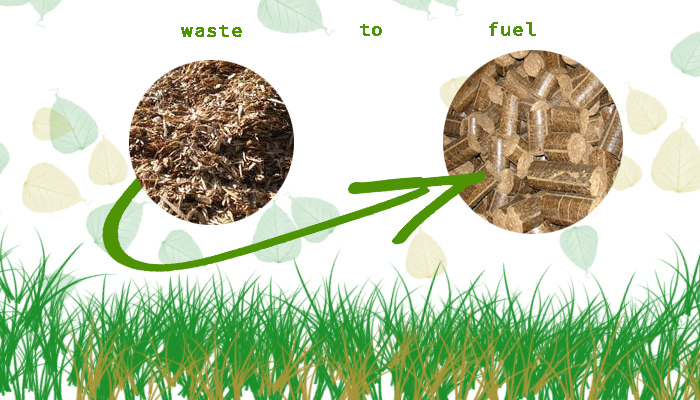 Biomass and agro forestry waste are used in briquetting process to make efficient bio fuel. Through this plant we can produce biomass energy, briquette and green electricity for our upcoming generation. Bio fuel briquettes are mostly made of green waste or organic materials which are commonly used for electricity generation, heating and cooking. These compressed mixes contain various organic materials like sugarcane bagasse, groundnut shells, almond shells, rice husk, wheat husk, municipal waste, green waste or anything that contains high nitrogen content. These all wasted materials are put into biomass briquette press to get high biomass energy and briquettes. These briquettes are different from charcoal because they do not have large concentrations of carbon substances. People have been using biomass briquettes in India since many years. The use of biomass briquettes is steadily increasing as industries realize that it can decrease pollution and best source to earn money from wasted material. Environment friendly, the use of biomass briquettes produces few greenhouse gases than fossil fuels. Briquettes are available in different shapes and sizes which are made from briquette plant. This plant is hope for the better future and proven as the best project form government. There is collection of briquetting machines which are made by expert biomass briquetting machine manufactures that have capability to make that type of briquetting machinery as per people’s need. They are making various types of briquetting machines and selling them at reasonable price which anyone can afford it. There are many briquetting press machine suppliers and exporters in India which have collection of this machinery and they are selling them at affordable cost.